As the capital and largest city of Belarus, Minsk represents a cultural center full of churches, libraries, museums, and theatres. The influence of the Soviet Union is quite apparent here, as most of the city was built up during this regime (after being razed during World War II). Today, Minsk is the base of the Commonwealth of Independent States. The dozens of cafes, shops, bars, and restaurants can keep you occupied for hours in this clean and safe city. While Minsk is not a popular tourist destination, it likely will give you the genuine Belarusian experience you are looking for. However, be aware that English is not widely spoken. Knowing some Russian phrases will be essential if you travel here. Minsk is in Belarus. 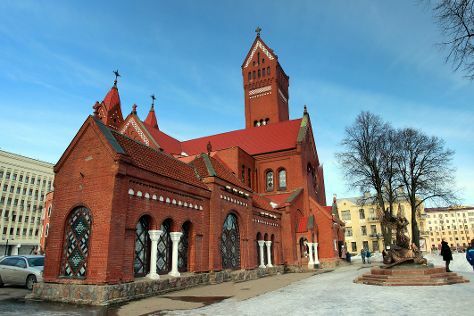 Take a look at our Belarus trip maker site to refine the details of your trip to Minsk. The funky town of Minsk is flooded with cool hotels and chic apartments to rent, many of which can be quite luxurious. Renting an apartment is a great option--and if you are traveling with a group, you can keep the cost per person down. While bed and breakfasts and guesthouses are not quite as popular in this city, you can find affordable lodging at the nice but less expensive hotels that may sacrifice location or amenities. Most hotels and hostels will arrange to register you as a foreigner with the police. If you rent an apartment-style accommodation, make sure to check in advance whether or not your host will do so. Without registration, you can stay in Belarus for only five business days.